After many years of discussion and dispute, EU controls were adopted in 2006 by Regulation (EC) No 1924/2006. This started to apply from July 2007 but elements became effective at various later dates and some aspects are still not operating. 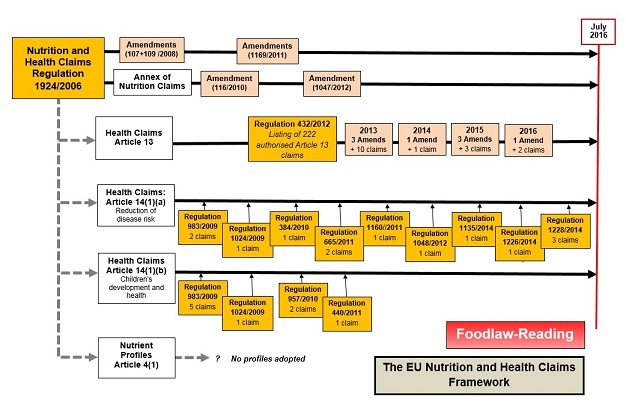 The Regulation contains an Annex which lists the permitted nutrition claims and the conditions which must be met if they are to be used. Subject to the provisions of the Regulation, these are generally available for use by any food meeting the stated conditions. Only authorised health claims can be used. The types of claims which can be authorised are set out in Articles 13 and 14 of the Regulation and it provides the procedures for gaining approval and for the establishment of a Register of Health Claims. (c) without prejudice to Directive 96/8/EC, slimming or weight-control or a reduction in the sense of hunger or an increase in the sense of satiety or to the reduction of the available energy from the diet. The first list of authorised claims (containing 222 claims) was published in 2012 and has been amended to add additional authorisations. A consolidated version of Regulation 432/2012 is available. See: Commission Regulation (EU) No 432/2012 (September 2016). The Register shows a total of 235 authorised Article 13 claims (of which 6 are restricted due to proprietary data) and 1,998 non-authorised Article 13 claims (October 2018). Note: Function claims for 'botanicals' have not yet progressed and remain outside the scope of the approved register of claims. Approximately 1,500 such claims were submitted for approval. These are defined as 'any health claim that states, suggests or implies that the consumption of a food category, a food or one of its constituents significantly reduces a risk factor in the development of a human disease'. These may be approved following the application of the standard approval process. These are being approved and listed in individual Regulations as follows. Additional Regulations provide details of rejected claims - these are not listed here. The Register shows a total of 14 authorised Article 14(1)(a) claims and 24 non-authorised Article 14(1)(a) claims (Octobere 2018). Article 14(1)(b) - Claims referring to children's development and health. These may be approved following the application of the standard approval process. These are being approved and listed in individual Regulations as follows. Additional Regulations provide details of rejected claims - these are not listed here. The Register shows a total of 12 authorised Article 14(1)(b) claims and 44 non-authorised Article 14(1)(b) claims (October 2018).